I still can’t believe that I was asked to write Roy of the Rovers. Roy of the Rovers? The football legend? Me? But it happened. And, when it did, several other authors got in touch to congratulate me. They admitted, too, that it was a dream they would have liked to have come true for them. And it is a dream. Because, for me, Roy was personal even before I put pen to paper. Because Roy Race helped changed my life. Roy of the Rovers played a part in encouraging me to become a reader. I might be a reader and a writer now. But I wasn’t. Not when I was eight, nine, ten. All I cared about, then, was football. I wanted to play football, watch football, make lists about football. Also, when I was that age, I was a reluctant reader. A very reluctant reader. I was intimidated by it. I feared it. Because books were for clever people about clever things that I didn’t understand. Books were what my sister read. Books were hard. And, on the rare occasions I tried to read one, I quickly felt like a failure for not having the stamina to get through even a few pages. But my mum was watching. She was determined to change that. Using football. 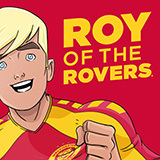 Football in Roy of the Rovers. My mum got me reading because I loved football. I was excited by reading. But reading Roy changed my life in another way too. It was his attitude. Roy didn’t give up. Roy took challenges on head on. When things went wrong, Roy would find a solution, not just blame others or blame himself, like I did with my reading. So, when I write Roy, I remember the kind of man he was. In the graphic novels and novels, the authors have tried to make Roy an inspiration for today’s young readers as he inspired all of us. Scouted starts with Roy remembering something he has read in a magazine. He uses that memory to develop as a footballer and as a person through the book. I wanted to start Roy of the Rovers: Scouted with a nod to reading magazines and comics. For obvious reasons. Roy of the Rovers: Scouted by Tom Palmer is out now!